Amazing, as it may seem, England was not always Christian. We do know that there was a Christian presence there before the Roman withdrawal of the Legions in the early 300's. Some scholars feel that travelers from the eastern half of the Empire had introduced Christianity initially, and then it spread among the native Celtic peoples of the island group. Celtic Christianity had its own distinctive variations, and Greek scholarship flourished in Ireland for several centuries after it had died elsewhere in Western Europe. In the 400's non-Christian Germanic tribes invaded Britain: the Angles, Saxons, and Jutes. They conquered the native Celtic Christians or drove them north and west into Cornwall, Wales, Scotland, and Ireland. In spite of the destruction of their world, Celtic Christian missionaries returned to England to preach the Gospel to the Pagans who had conquered them. To make a link to modern readers, here is a question, could Evangelicals do the same should a "Hispanic Horde" "conquer" the USA? I wonder if love would be our motivation. During this time, the Patron of my Order, Gregory the Great, (Bishop of Rome) decided to send missionaries, a group of monks led by their prior, Augustine. On their way, they lost heart and in fear Augustine went back to Rome from Provence and asked that the mission be given up. The Pope, however, commanded and encouraged them to proceed, and they landed in Kent (the southeast corner of England) in 597, and the king, whose wife was a Christian, allowed them to settle and preach. King Ethelbert's wife, Queen Bertha, daughter of Charibert, one of the Merovingian kings of the Franks, had brought a chaplain with her (Liudhard) and either built a church, or restored a church in Canterbury from Roman times. King Ethelbert himself was a pagan, but allowed his wife to worship God her own way. Probably under influence of his wife, Ethelbert asked Pope Gregory I to send missionaries. This world may never know the influence this godly woman had on subsequent history. Their preaching was outstandingly successful, the people were hungry for the Good News of salvation, and they made thousands of converts in a short time. In 601 the King Ethelbert himself was converted and baptized. Then Augustine was consecrated bishop and established his headquarters at Canterbury. From his day to the present, there has been an unbroken succession of archbishops of Canterbury. In 603, Augustine tried to unite the local Celtic Church with Rome, but without much success. There hadn't been much in the way of cooperation along these lines during the whole of his time in England. Old attachments to provincial customs and practices were simply too ingrained. However, with Canterbury firmly established as the ecclesiastical center of England, use of the Roman Rite and calendar would, after his death be universally accepted. O Lord our God, Who by Your Son Jesus Christ called Your apostles and sent them forth to preach the Gospel to the nations: We bless Your holy name for Your servant Augustine, first Archbishop of Canterbury, whose labors in propagating Your Church among the English people we commemorate today; and we pray that all whom You call and send may do Your will, and bide Your time, and see Your glory; through Jesus Christ our Lord, Who lives and reigns with You and the Holy Spirit, one God, for ever and ever. Amen. Today, at my oldest son's wedding, I will read the blessing which I reproduce below. He has chosen well, and his wife is a fine, lovely Christian woman. It seems but a flash that was 22 years ago, and I was holding this little guy in one hand, now he is 6'4" and quite grown up. I am proud of his success and this will be a wonderful day to start his joint journey with his bride. Eternal God, Creator and Preserver of all life, Author of salvation, and Giver of all grace: Look with favor upon the world You have made, and for which Your Son gave his life, and especially upon John and Faith whom You make one flesh in Holy Matrimony. Give them wisdom and devotion in the ordering of their common life, that each may be to the other a strength in need, a counselor in perplexity, a comfort in sorrow, and a companion in joy. Give them grace, when they hurt each other, to recognize and acknowledge their fault, and to seek each other's forgiveness and Yours. Make their life together a sign of Christ's love to this sinful and broken world, that unity may overcome estrangement, forgiveness heal guilt, and joy conquer despair. Bestow on them, if it is Your will, the gift and heritage of children, and the grace to bring them up to know You, to love You, and serve You. Give them such fulfillment of their mutual affection that they may reach out in love and concern for others. Grant that all married persons who have witnessed these vows may find their lives strengthened and their loyalties confirmed. Grant that the bonds of our common humanity, by which all Your children are united one to another, and the living to the dead, may be so transformed by Your grace, that Your will may be done on earth as it is in heaven; where, O Father, with Your Son and the Holy Spirit, You live and reign in perfect unity, now and for ever. Recently I publicly discussed my need for repentance and conversion. I would like to unpack that a bit so people can see what I, as an Episcopalian Christian mean by this act. Repentence and conversion, I think, are acts that are alien to our human nature, and seem to me to be some what forgotten or perhaps downplayed in these times. First of all, in my tradition, we all repent, and often for our many sins, especially me, *I* do, for my sins. Repentance is taking personal responsibility and owning the mistake. No blaming, no "Devil made me do it", accept that we are flawed and face it. I feel that to get lost in the blame game gets us away from the Gospel admonition to reviewing the log in our own eyes. Conversion is changing your life and healing the wrong. "I confess to Almighty God, to His Church, and to you, that I have sinned by my own fault in thought, word, and deed, in things done and left undone; especially__________." No half statements here, though generally private, penance might need to be as open as the sin was. In my case, I shall donate that item mentioned in my last post to charity, giving it away. That's how it looks to me, no long term grovelling. Face up to the flaw, own it, ask forgiveness, recieve it and fix the error as best we can. I believe that whatever you call it, true repentance requires personal accountability and restorative action. My friend Kyle has a post up about Conversion in his life. It has gotten me to thinking about an incident that happened this weekend in my life. My neighborhood had a joint garage sale. I am not really the kind of guy that does this, but I have wanted to reduce the amount of 'stuff' in my life and felt this was a good way to do it. Amazingly enough I was right, wow so much was sold. 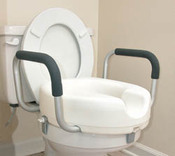 One of the articles was a raised toilet seat. I had purchased it when my brother was so ill, but he had died before he could use it. So here I had this new seat, which I had spent $70 dollars on. I decided to ask $10 and did not think that was a bad deal at all. In the later morning a woman came to the sale, and walked around a bit and asked about the seat, when I told her $10 she balked a little and then continued chatting pleasantly as she headed to her car. I got a little miffed thinking that 10 bucks was not so much to ask for a new, unused piece of medical equipment. Just as she got into her car, she said that she was looking for one because 'her husbanded needed it so'. Off she drove, before I could react to her words. There I stood, shocked that I had refused help to a sick man over $10. This seat just sits in a closet in my house. I hadn't even considered that she had a sick family member and that the money could have been beyond her limited means. I was hoping she would come back, but she didn't. How could I have been so greedy so to miss her obvious need? No wonder GREED is a mortal sin, it blinds us from compassion. Conversion. Obviously I need it. You hear the phrase "carry your cross" or "we all have a cross to bear" but today, the Church celebrates the one human who can literally say he carried the Cross. As Jesus was staggering under the load, shouldering his cross out of Jerusalem to the place of execution, there was a guy in the crowd coming in from a place called Cyrene. His name was Simon, a Jew from Cyrene, who was in Jerusalem for the Passover. The Roman soldiers picked him out of what was probably a large group of people watching the executions. Why? Was he taller? Did he catch the eye of the Centurion because he looked strong enough to carry the load with out further delay? We will never know. 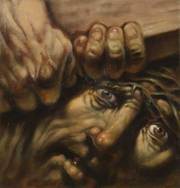 I chose this image to portray the strength of Simon and how he helped the traumatized Jesus. Click on the link to view the artist's website. We do know that the Romans had a legal right of a soldier to require a provincial to carry his gear one mile for him, and that is probably the law used in this case. Simon was a bystander, yet he was chosen to act in a powerful drama that he could not know was occurring when he arrived in Jerusalem that day. He wasn't a follower of this Rabbi being executed, he did not know His family, friends or even His message. He was from Cyrene, some distance away in Africa. Plucked out of obscurity by "chance" Simon was compelled to take near center stage at the very Redemption of humanity. But did Simon just go his on way unaffected? No. Somehow, Jesus in the short time He had with Simon touched him in some profound way that forever changed him. What questions did he ask? Perhaps "who are You" or "why are they doing this"? We know that the Gospeler Mark tells us that Simon was "the father of Alexander and Rufus" without further explanation, apparently taking it for granted that his readers would all know who Rufus and Alexander are. About a century later, the Christian writer Papias tells us that Mark originally wrote his Gospel for the Christian community in Rome. It appears that Alexander and Rufus were well known to, and probably part of, the Christian community in Rome. Also in the Acts of the Apostles, we hear that some "men of Cyrene" are preaching the Gospel in Antioch. Was Simon one of them? We don't know for certain, but it does seem that Simon was converted on that day, carrying the Cross of Christ, and his children followed the Lord after him. The question is, how does carrying each other's burdens convert us? Do we accept help like Jesus did, or do we try to shoulder our burdens alone? At the same time do we offer help to the helpless? What of the suffering people of Myanmar? Heavenly Father, Whose most dear Son, as He walked the way of the Cross, accepted the service of Simon of Cyrene to carry His physical burden for Him: grant us each the grace gladly to bear one another's burdens, for the love of Him who said, "As you did it to the least of these My brethren, you did it to Me," Your Son Jesus Christ our Lord, Who now lives and reigns with You and the Holy Spirit, one God, now and for ever. Amen. Pentecost is here and Easter season ends. The name tells us that it is the fiftieth day (pentekoste in the Greek) of Easter, the last day of the celebration of the Resurrection of Jesus Christ. The nine days from Ascension Day to the Eve of Pentecost are the original novena--nine days of prayer. Before He ascended, Jesus ordered the disciples not to leave Jerusalem, but to wait there to be baptized by the Holy Spirit. 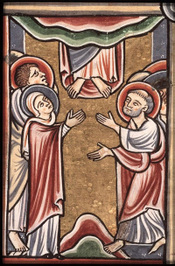 After His Ascension, they returned to the upper room in Jerusalem where they devoted themselves to prayer. Like Ascension Day, Pentecost is its own major event in the history of our salvation since it is the coming of the Holy Spirit. It is the day on which the Church is filled and empowered by the Spirit and, as we read in Acts, begins to grow and bear Fruit, proclaiming the Gospel of the One who died and rose again. Fr. Thomas Keating tells us that: "The Fruits of the Spirit are indications of God's presence at work in us in varying degrees and forms. Through the Fruits, the Spirit is becoming a reality in our lives. By manifesting the fruits in daily life we bear witness to the resurrection of Christ in a most profound manner. It is not so much preaching or teaching, but our rootedness in the Spirit that communicates Christ's life to the people around us--to our family, friends, and those with whom we work. If we are rooted in the Spirit, these fruits inevitably begin to appear." So then, how will we choose to live out our vocation as Pentecostal stewards of God's Holy Spirit? Will we seek a full, deep relationship with the Divinity that compels us to move beyond both Church and home to the world beyond? Will we use these Fruits so richly bestowed to ensure that the world He died for is blessed through us? Be Pentecostal, it is how we are empowered to live the Gospel. Almighty and gracious God, we come to You with our hearts full of prayers both spoken and those that cannot be put into words. As the ancient psalmist wrote You are our refuge and strength, the light in the darkness, and so with confidence we offer our prayers to You for Myanmar, striken by violent powerful winds, rain and terrifying, destructive ocean surges. Gather them and us under Your wings, calm all our fears and keep our faith strong. At a time like this we stand in awe of the power of nature - the wind and the sea - with its terrible capacity to destroy as well as to save and we are reminded of our vulnerability as human creatures who inhabit this vast earth. We bring to You in prayer our questions, our humility and also our trust in this hour of need. We pray for those who grieve the loss of family, friends and neighbors, for those who are injured, those separated and searching for family, for those who have been traumatized. we ask for Your continued healing presence in their lives and we commend to Your care all those who have died. We give to Your loving care all those who are involved in rescuing people and those caring for the injured in hospitals and clinics. Be especially with all the churches and people as they minister in Your name to the people. May they be the Christ Who serves with wounded hands,and stretch out their hands to serve. Sustain them through this time of tremendous loss and stress. We commend to Your care all those are working in debris removal and cleaning up. We especially pray for those burdened by unimaginable losses and who have found themselves like refugees in their own country. May shelter and clean water and food and medicines and comfort be supplied as quickly as possible. We pray for those communities that have been devastated that they may live and learn and support one another and have joy in their lives once again. May this disaster bring people together to rebuild their cities, and to fill their lives with justice, their plates with food and their streets with music,. Bring them peace and healing from all evil. We pray for those traveling, who feel homesick and far away from loved ones and their homes at this time; those who are trying to get in contact with family and who are worried and frustrated and who long to embrace their families. Comfort families across the distance. We give thanks to God for the blessings in our lives, especially the gifts we so often take for granted until they are in danger of being taken away from us - the gift of family, friends, a home, our possessions. Most of all we praise God for the gift of life itself. We also pray for all people of the human family all around the world affected by other natural disasters. O God, Great Shepherd of the sheep, gather us all in Your arms and lead us safely within the one fold of Your love.